Sapienza University of Rome (Italian Università di Roma "La Sapienza") is a coeducational, autonomous state university in Rome, Italy. It is the largest European university and the most ancient of the city's three state-funded universities; Sapienza was founded in 1303, Tor Vergata in 1982, and Roma Tre in 1992. In Italian, sapienza means "wisdom" or "knowledge". According to the Academic Ranking of World Universities published by the Institute of Higher Education of Shanghai Jiao Tong University, Sapienza University of Rome ranks among top 30 european universities and as one of the best Italian Universities, together with the Universities of Milan, Pisa and Bologna. 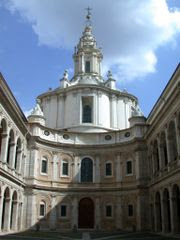 La Sapienza was founded in 1303 by Pope Boniface VIII who issued the bull "In supremae praeminentia dignitatis" on 20 April, 1303, as a Studium for ecclesiastical studies more under his control than the universities of Bologna and Padua. The pope established it in order that Rome might become the fruitful mother of science. In 1431, Pope Eugene IV completely reorganized the studium with the bull "In supremae", in which he granted masters and students alike the broadest possible privileges and decreed that the university should include the four Faculties of Law, Medicine, Philosophy and Theology. He introduced a new tax on wine, in order to raise funds for the university; the money was used to buy a palace that later hosted the Sant'Ivo alla Sapienza church, "La Sapienza." The university's days of splendor, however, came to an end during the sack of Rome in 1527 when the 'studium' was closed, the professors were dispersed, and some were killed. Pope Paul III restored the university shortly after his ascension to the pontificate in 1534. In the 1650s the university became known as Sapienza meaning wisdom, which title it retained until now. Pope Clement XI purchased some land, in 1703, with his private funds on the Janiculum, where he made a botanical garden, which soon became the most celebrated in Europe through the labours of the brothers Trionfetti. During the 19th-century Italian revival, a new fervor animated university students. In 1870, La Sapienza stopped being the papal university and became the university of the capital of Italy. In 1935, the new university campus, planned by Marcello Piacentini, was completed. On 27 October 1935, the university became an aggregate of all the institutions of higher learning of university rank in the city of Rome. Since 1935 Sapienza University has been under the control of the Italian Government. 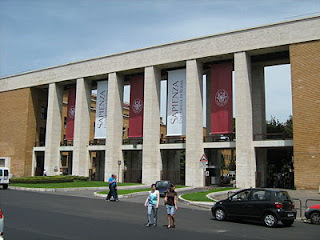 As of the academic year 2007/2008, La Sapienza consisted of twenty-one faculties and 140,250 students. The Alessandrina University Library founded in 1670 is the main library housing 1,500,000 volumes. Sapienza University has many locations in Rome, but is mainly situated in the Città Universitaria covering 439,000 square meter, near Termini Station. Outside of Rome the university has four campuses; Civitavecchia, Latina, Pomezia, and Rieti.